Male white-headed woodpecker in Yakima County (photo by Joe Higbee). White-headed woodpeckers breed from southern British Columbia and western Idaho to southern California (Garrett et al. 1996). They are not abundant anywhere in their range, and abundance decreases north of California. They are uncommon to rare in their range in Washington, Oregon, and Idaho (Frederick and Moore 1991, Marshall 1997). In Washington, they are found in ponderosa pine (Pinus ponderosa) forests on the east slopes of the Cascade Range as well as in the Okanogan Highlands and Blue Mountains. Habitat. 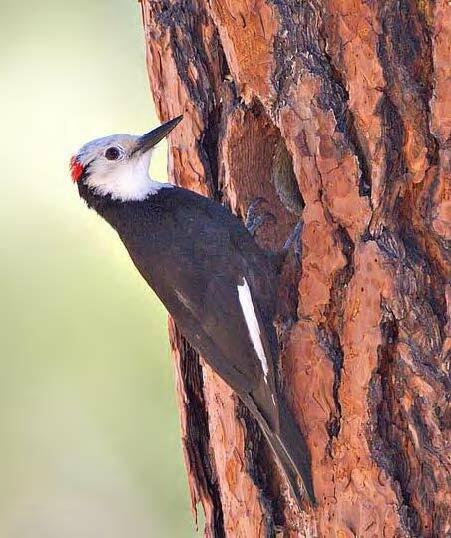 White-headed woodpeckers are primarily associated with open-canopied ponderosa pine forests. They often use large well-decayed snags for nesting and roosting, and they forage primarily on the bark of large ponderosa pines (>60 cm [24 in] dbh) (Thomas et al. 1979, Raphael and White 1984, Garrett et al. 1996). Kozma (2009), however, described 36 nest sites in managed forest with smaller trees (nest tree mean of ~36.6 cm dbh). White-headed woodpeckers prefer to forage for insects on the scaly bark of live trees (Raphael and White 1984, Morrison et al. 1987), and they feed heavily on seeds from unopened pine cones during winter (Ligon 1973, Garrett et al. al. 1996). White-headed woodpeckers usually nest low to the ground (<10 m [33 ft], mean = 2-3 m [6.5-10 ft]) in cavities within snags and stumps (Raphael and White 1984, Milne and Hejl 1989). This species infrequently nests in live trees (Buchanan et al. 2003). Nest trees include ponderosa pine, jeffrey pine (Pinus jeffreyi), lodgepole pine ( Pinus contorta), sugar pine (Pinus lambertiana), white fir (Abies concolor), red fir (Abies magnifica), and occasional quaking aspen (Populus tremuloides) (Raphael and White 1984, Milne and Hejl 1989, Dixon 1995b, Garrett et al. 1996). Studies conducted outside of Washington found that white-headed woodpeckers prefer nesting in snags or trees that are 4 -8 m (13-26 ft) tall with a dbh of 65-80 cm (26-31 in) (Raphael and White 1984; Milne and Hejl 1989; Dixon 1995a, b; Garrett et al. 1996). In eastern Washington, this species nests primarily in ponderosa pine snags averaging 12.6 m (41.3 ft) in height with a mean dbh of 51.5 cm (20.3 in) (Buchanan et al. 2003). Larger trees and snags characterized the immediate surroundings of active nest sites. The canopy closure in sites containing nesting birds was considerably open, averaging 7.2%. Kozma (2009) observed nest initiation in May and early June in Washington. Incubation takes 14 days, and young leave the nest after a 26-day fledging period (Garrett et al. 1996). Mean clutch size was 4 eggs for 21 nests in Washington, and mean number fledged was 2.54 for 24 nests (Kozma 2009). The importance of pine seed in its diet appears to vary regionally (Morrison and With 1987). Other food sources include ants, beetles, termites, scale insects, and insect larvae, sap, and plant matter (Ligon 1973, Garrett et al. 1996). Foraging involves gleaning insects from the trunks of live trees and snags, typically pines and firs, foliage gleaning, and drilling into pine cones (Raphael and White 1984, Morrison et al. 1987, Garrett et al. 1996). Garrett et al. (1996) indicated that they feed on sap only occasionally, but Kozma (2010) reported that ponderosa pine sap is an important food source in Washington during spring when pine seedscrops fail or are seasonally depleted. White-headed woodpeckers most frequently roost in cavities, but also roost in spaces behind peeling bark and in crevices within tree trunks (Dixon 1995a, b; Garrett et al. 1996). They typically roost in ponderosa pines (live trees and snags) averaging 60 cm (24 in) dbh and 7 m (23 ft) tall. Males roost in the nest cavity with their young until they fledge. Cavities are also used as winter roosts, and frequently the same cavity is used over an entire season (Dixon 1995a, b; Garrett et al. 1996). Home ranges of white-headed woodpeckers appear to require larger areas to reproduce in a managed forest landscape than in relatively contiguous old growth. In fragmented habitat, home ranges averaged 321 ha (793 ac) and 342 ha (845 ac) for central and south-central Oregon, respectively, but were much smaller in continuous old growth (104 ha [257 ac] and 212 ha [524 ac]) (Dixon 1995a, b). Conservation. Population data that would demonstrate a clear trend are not available for Washington, but historical logging of ponderosa pine and habitat changes resulting from fire exclusion are believed to have resulted in a decline of this species. Generally open, parklike, old-growth stands with grassy understories that were maintained by frequent, low- and moderate-intensity fires once typified the dry forest landscape of eastern Washington and Oregon, and covered extensive areas prior to 1850 (Everett et al. 1994). A long history of selective harvesting of large pines, intensive grazing, and fire suppression greatly altered this forest landscape. For example, Henjum et al. (1994) estimated that 92%–98% of the old-growth ponderosa pine that once existed in the Deschutes, Fremont, and Winema national forests in Oregon has been logged or converted to other land uses. Garrett et al. (1996) stated that the loss of large-diameter ponderosa pine poses the greatest threat to this species. Wisdom et al. (2000) identified the decline in late-seral ponderosa pine and basin-wide loss of large diameter snags (>53 cm [21 in]), as high priority issues for white-headed woodpeckers. The production of pine seed and foraging efficiency of bark-gleaning are both correlated with tree size (Raphael and White 1984, Krannitz and Duralia 2004, Covert-Bratland et al. 2006). White-headed woodpeckers are a weak primary cavity excavator and require snags with at least moderate decay for nesting (Kozma 2009). Population stability will require maintaining an adequate supply of soft snags. Kozma (2009, 2010) reported that although white-headed woodpeckers were able to reproduce in younger managed forest, he noted that they fledged fewer young than hairy woodpeckers and hypothesized that managed stands do not provide adequate resources to fledge as many young. The predominance of smaller-diameter trees in some landscapes may force them to forage over a much larger area to obtain important pine seed resources (Dixon 1995a, b). Partners and cooperators: U.S. Forest Service, Yakama Nation. Buchanan, J. B., R. E. Rogers, D. J. Pierce, and J. E. Jacobson. 2003. Nest-site habitat use by white-headed woodpeckers in the eastern Cascade Mountains, Washington. Northwestern Naturalist 84:119-128. Connor, R. N. 1979. Minimum standards and forest wildlife management. Wildlife Society Bulletin 7:293-296. Covert-Bratland, K. A., W.M. Block, and T. C. Theimer. 2006. Hairy woodpecker winter ecology in ponderosa pine forests representing different ages since wildfire. Journal of Wildlife Management 70:1379–1392. Dixon, R. D. 1995a. Density, nest-site and roost-site characteristics, home-range, habitat-use, and behavior of white- headed woodpeckers: Deschutes and Winema National Forests, Oregon. Oregon Department of Fish and Wildlife Nongame Report 93-3-01, Portland, Oregon, USA. Dixon, R. D. 1995b. Ecology of the white-headed woodpecker in the Central Oregon Cascades. M. S. thesis, University of Idaho, Moscow, Idaho, USA. Everett, R., P. Hessburg, J. Lehmkuhl, M. Jensen, and P. Bourgeron. 1994. Old forests in dynamic landscpaes. Journal of Forestry 92: 22-25. Frederick,G.P. and T.L. Moore 1991. Distribution and habitat of white-headed woodpeckers (Picoides albolarvatus) in west-central Idaho.Conservation Data Center, Idaho Department of Fish and Game, Boise, Idaho. Garrett, K. L., M. G. Raphael, and R. D. Dixon. 1996. White-headed woodpecker (Picoides albolarvatus). Number 252 in A. Poole and F. Gill, editors. The Birds of North America. Academy of National Science and American Ornithologists’ Union, Philadelphia, Pennsylvania, USA. Henjum, M. G., J. B. Karr, D. L. Bottom, D. A. Perry, J. C. Bednarz, S. G. Wright, S. A. Beckwitt, and E. Beckwitt. 1994. Interim protection for late-successional forests, fisheries, and watersheds: national forests east of the Cascade crest, Oregon and Washington. The Wildlife Society Technical Review 94-2. Bethesda, Md. 245 pp. Kozma, J. M. 2009. Nest-site attributes and reproductive success of white-headed and hairy woodpeckers along the east slope Cascades of Washington state. Pp. 52-61, in T. D. Rich, C. Arizmendi, D. W. Demarest, and C. Thompson (eds.). Tundra to Tropics: Connecting Birds, Habitats and People. Proceedings of the Fourth International Partners in Flight Conference. Kozma , J. M. 2010. Characteristics of trees used by white-headed woodpeckers for sap feeding in Washington. Northwestern Naturalist 91:81-86. Kozma, J. M. 2011. Composition of forest stands used by white-headed woodpeckers for nesting in Washington. Western North American Naturalist 71(1):1-9. Krannitz, P. G., and T. E. Duralia. 2004. Cone and seed production in Pinus ponderosa: a review. Western North American Naturalist 64:208–218. Ligon, J. D. 1973. Foraging behavior of the white-headed woodpecker in Idaho. Auk 90:862-869. Marshall, D. B. 1997. 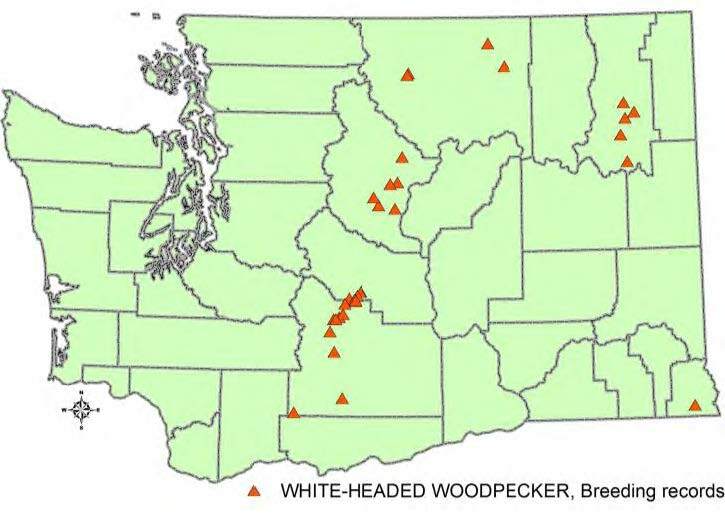 Status of the white-headed woodpecker in Oregon and Washington. Audubon Society of Portland, Oregon. 50 pp. Milne, K. A., and S. J. Hejl. 1989. Nest-site characteristics of white-headed woodpeckers. Journal of Wildlife Management 53:50-55. Morrison, M. L., and K. A. With. 1987. Interseasonal and intersexual resource partitioning in the white-headed and hairy woodpeckers. Auk 104:225-233. Morrison, M. L., K. A. With, I. C. Timossi, W. M. Block, and K. A. Milne. 1987. Foraging behavior of bark- foraging birds in the Sierra Nevada. Condor 89:201-204. Raphael, M. G., and M. White. 1984. Use of snags by cavity-nesting birds in the Sierra Nevada. Wildlife Monographs 86:1-66. Thomas, J. W., R. G. Anderson, C. Maser, and E. L. Bull. 1979. Snags. Number 553 in J. W. Thomas, technical editor. Wildlife habitats in managed forests- the Blue Mountains of Oregon and Washington. USDA Forest Service Handbook, Portland, Oregon, USA. Wisdom, M. J., R.S. Holthausen, B. C. Wales, C. D. Hargis, V. A. Saab, D. C. Lee, W. J. Hann, T. D. Rich, M. M. Rowland, W. J. Murphy, M. R. Eames. 2000. Source habitats for terrestrial vertebrates of focus in the interior Columbia basin: broadscale trends and management implications. Volume 2—Group level results. Gen. Tech. Rep. PNW-GTR-485. Portland, OR: U.S. Department of Agriculture, Forest Service, Pacific Northwest Research Station.